By learning OpenGL, you've decided that you want to do all of the hard work yourself. That inevitably means that you'll be thrown in the deep, but once you understand the essentials, you'll see that doing things the hard way doesn't have to be so difficult after all. To top that all, the exercises at the end of this chapter will show you the sheer amount of control you have over the rendering process by doing things the modern way! The graphics pipeline covers all of the steps that follow each other up on processing the input data to get to the final output image. I'll explain these steps with help of the following illustration. It all begins with the vertices, these are the points from which shapes like triangles will later be constructed. Each of these points is stored with certain attributes and it's up to you to decide what kind of attributes you want to store. Commonly used attributes are 3D position in the world and texture coordinates. The vertex shader is a small program running on your graphics card that processes every one of these input vertices individually. This is where the perspective transformation takes place, which projects vertices with a 3D world position onto your 2D screen! It also passes important attributes like color and texture coordinates further down the pipeline. After the input vertices have been transformed, the graphics card will form triangles, lines or points out of them. These shapes are called primitives because they form the basis of more complex shapes. There are some additional drawing modes to choose from, like triangle strips and line strips. These reduce the number of vertices you need to pass if you want to create objects where each next primitive is connected to the last one, like a continuous line consisting of several segments. The following step, the geometry shader, is completely optional and was only recently introduced. Unlike the vertex shader, the geometry shader can output more data than comes in. It takes the primitives from the shape assembly stage as input and can either pass a primitive through down to the rest of the pipeline, modify it first, completely discard it or even replace it with other primitive(s). Since the communication between the GPU and the rest of the PC is relatively slow, this stage can help you reduce the amount of data that needs to be transferred. With a voxel game for example, you could pass vertices as point vertices, along with an attribute for their world position, color and material and the actual cubes can be produced in the geometry shader with a point as input! 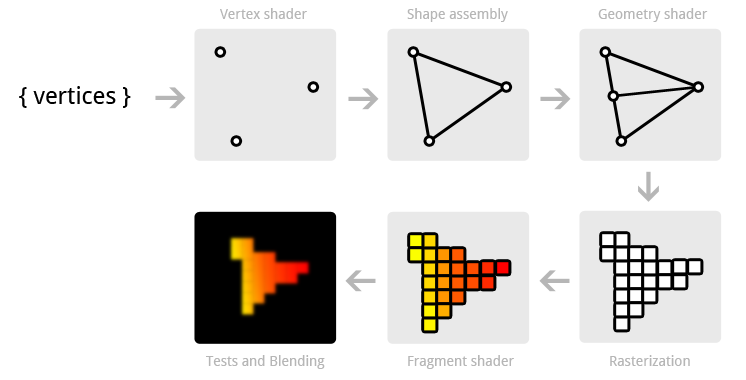 After the final list of shapes is composed and converted to screen coordinates, the rasterizer turns the visible parts of the shapes into pixel-sized fragments. The vertex attributes coming from the vertex shader or geometry shader are interpolated and passed as input to the fragment shader for each fragment. As you can see in the image, the colors are smoothly interpolated over the fragments that make up the triangle, even though only 3 points were specified. The fragment shader processes each individual fragment along with its interpolated attributes and should output the final color. This is usually done by sampling from a texture using the interpolated texture coordinate vertex attributes or simply outputting a color. In more advanced scenarios, there could also be calculations related to lighting and shadowing and special effects in this program. The shader also has the ability to discard certain fragments, which means that a shape will be see-through there. Finally, the end result is composed from all these shape fragments by blending them together and performing depth and stencil testing. All you need to know about these last two right now, is that they allow you to use additional rules to throw away certain fragments and let others pass. 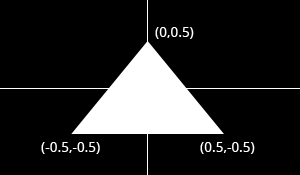 For example, if one triangle is obscured by another triangle, the fragment of the closer triangle should end up on the screen. Now that you know how your graphics card turns an array of vertices into an image on the screen, let's get to work! The first thing you have to decide on is what data the graphics card is going to need to draw your scene correctly. As mentioned above, this data comes in the form of vertex attributes. You're free to come up with any kind of attribute you want, but it all inevitably begins with the world position. Whether you're doing 2D graphics or 3D graphics, this is the attribute that will determine where the objects and shapes end up on your screen in the end. When your vertices have been processed by the pipeline outlined above, their coordinates will have been transformed into device coordinates. Device X and Y coordinates are mapped to the screen between -1 and 1. Just like a graph, the center has coordinates (0,0) and the y axis is positive above the center. This seems unnatural because graphics applications usually have (0,0) in the top-left corner and (width,height) in the bottom-right corner, but it's an excellent way to simplify 3D calculations and to stay resolution independent. The triangle above consists of 3 vertices positioned at (0,0.5), (0.5,-0.5) and (-0.5,-0.5) in clockwise order. It is clear that the only variation between the vertices here is the position, so that's the only attribute we need. Since we're passing the device coordinates directly, an X and Y coordinate suffices for the position. OpenGL expects you to send all of your vertices in a single array, which may be confusing at first. To understand the format of this array, let's see what it would look like for our triangle. As you can see, this array should simply be a list of all vertices with their attributes packed together. The order in which the attributes appear doesn't matter, as long as it's the same for each vertex. The order of the vertices doesn't have to be sequential (i.e. the order in which shapes are formed), but this requires us to provide extra data in the form of an element buffer. This will be discussed at the end of this chapter as it would just complicate things for now. The next step is to upload this vertex data to the graphics card. This is important because the memory on your graphics card is much faster and you won't have to send the data again every time your scene needs to be rendered (about 60 times per second). The memory is managed by OpenGL, so instead of a pointer you get a positive number as a reference to it. GLuint is simply a cross-platform substitute for unsigned int, just like GLint is one for int. You will need this number to make the VBO active and to destroy it when you're done with it. As hinted by the GL_ARRAY_BUFFER enum value there are other types of buffers, but they are not important right now. This statement makes the VBO we just created the active array buffer. Now that it's active we can copy the vertex data to it. GL_STATIC_DRAW: The vertex data will be uploaded once and drawn many times (e.g. the world). GL_DYNAMIC_DRAW: The vertex data will be created once, changed from time to time, but drawn many times more than that. GL_STREAM_DRAW: The vertex data will be uploaded once and drawn once. This usage value will determine in what kind of memory the data is stored on your graphics card for the highest efficiency. For example, VBOs with GL_STREAM_DRAW as type may store their data in memory that allows faster writing in favour of slightly slower drawing. The vertices with their attributes have been copied to the graphics card now, but they're not quite ready to be used yet. Remember that we can make up any kind of attribute we want and in any order, so now comes the moment where you have to explain to the graphics card how to handle these attributes. This is where you'll see how flexible modern OpenGL really is. As discussed earlier, there are three shader stages your vertex data will pass through. Each shader stage has a strictly defined purpose and in older versions of OpenGL, you could only slightly tweak what happened and how it happened. With modern OpenGL, it's up to us to instruct the graphics card what to do with the data. This is why it's possible to decide per application what attributes each vertex should have. You'll have to implement both the vertex and fragment shader to get something on the screen, the geometry shader is optional and is discussed later. Shaders are written in a C-style language called GLSL (OpenGL Shading Language). OpenGL will compile your program from source at runtime and copy it to the graphics card. Each version of OpenGL has its own version of the shader language with availability of a certain feature set and we will be using GLSL 1.50. This version number may seem a bit off when we're using OpenGL 3.2, but that's because shaders were only introduced in OpenGL 2.0 as GLSL 1.10. Starting from OpenGL 3.3, this problem was solved and the GLSL version is the same as the OpenGL version. The vertex shader is a program on the graphics card that processes each vertex and its attributes as they appear in the vertex array. Its duty is to output the final vertex position in device coordinates and to output any data the fragment shader requires. That's why the 3D transformation should take place here. The fragment shader depends on attributes like the color and texture coordinates, which will usually be passed from input to output without any calculations. Remember that our vertex position is already specified as device coordinates and no other attributes exist, so the vertex shader will be fairly bare bones. The #version preprocessor directive is used to indicate that the code that follows is GLSL 1.50 code using OpenGL's core profile. Next, we specify that there is only one attribute, the position. Apart from the regular C types, GLSL has built-in vector and matrix types identified by vec* and mat* identifiers. The type of the values within these constructs is always a float. The number after vec specifies the number of components (x, y, z, w) and the number after mat specifies the number of rows /columns. Since the position attribute consists of only an X and Y coordinate, vec2 is perfect. When you're working with colors, you can also access the individual components with r, g, b and a instead of x, y, z and w. This makes no difference and can help with clarity. The final position of the vertex is assigned to the special gl_Position variable, because the position is needed for primitive assembly and many other built-in processes. For these to function correctly, the last value w needs to have a value of 1.0f. Other than that, you're free to do anything you want with the attributes and we'll see how to output those when we add color to the triangle later in this chapter. The output from the vertex shader is interpolated over all the pixels on the screen covered by a primitive. These pixels are called fragments and this is what the fragment shader operates on. 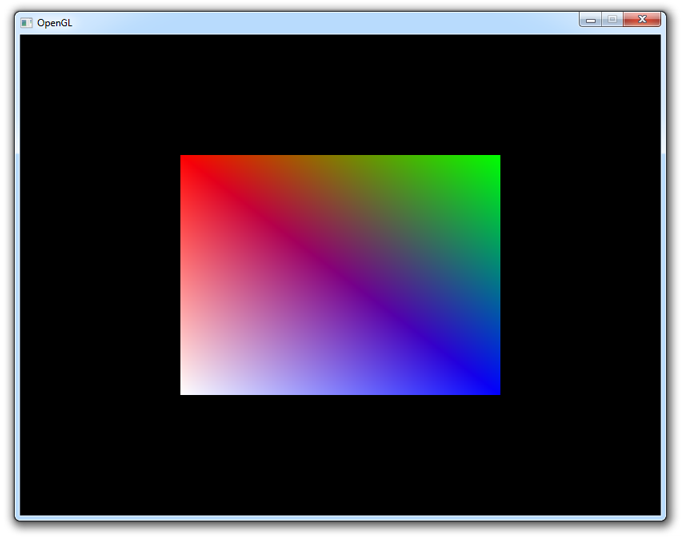 Just like the vertex shader it has one mandatory output, the final color of a fragment. It's up to you to write the code for computing this color from vertex colors, texture coordinates and any other data coming from the vertex shader. You'll immediately notice that we're not using some built-in variable for outputting the color, say gl_FragColor. This is because a fragment shader can in fact output multiple colors and we'll see how to handle this when actually loading these shaders. The outColor variable uses the type vec4, because each color consists of a red, green, blue and alpha component. Colors in OpenGL are generally represented as floating point numbers between 0.0 and 1.0 instead of the common 0 and 255. Just like vertex buffers, creating a shader itself starts with creating a shader object and loading data into it. Unlike VBOs, you can simply pass a reference to shader functions instead of making it active or anything like that. The glShaderSource function can take multiple source strings in an array, but you'll usually have your source code in one char array. The last parameter can contain an array of source code string lengths, passing NULL simply makes it stop at the null terminator. Be aware that if the shader fails to compile, e.g. because of a syntax error, glGetError will not report an error! See the block below for info on how to debug shaders. If status is equal to GL_TRUE, then your shader was compiled successfully. This will store the first 511 bytes + null terminator of the compile log in the specified buffer. The log may also report useful warnings even when compiling was successful, so it's useful to check it out from time to time when you develop your shaders. Again, be sure to check if your shader was compiled successfully, because it will save you from a headache later on. Up until now the vertex and fragment shaders have been two separate objects. While they've been programmed to work together, they aren't actually connected yet. This connection is made by creating a program out of these two shaders. Use glDrawBuffers when rendering to multiple buffers, because only the first output will be enabled by default. After attaching both the fragment and vertex shaders, the connection is made by linking the program. It is allowed to make changes to the shaders after they've been added to a program (or multiple programs! ), but the actual result will not change until a program has been linked again. It is also possible to attach multiple shaders for the same stage (e.g. fragment) if they're parts forming the whole shader together. A shader object can be deleted with glDeleteShader, but it will not actually be removed before it has been detached from all programs with glDetachShader. Just like a vertex buffer, only one program can be active at a time. The location is a number depending on the order of the input definitions. The first and only input position in this example will always have location 0. The first parameter references the input. The second parameter specifies the number of values for that input, which is the same as the number of components of the vec. The third parameter specifies the type of each component and the fourth parameter specifies whether the input values should be normalized between -1.0 and 1.0 (or 0.0 and 1.0 depending on the format) if they aren't floating point numbers. The last two parameters are arguably the most important here as they specify how the attribute is laid out in the vertex array. The first number specifies the stride, or how many bytes are between each position attribute in the array. The value 0 means that there is no data in between. This is currently the case as the position of each vertex is immediately followed by the position of the next vertex. The last parameter specifies the offset, or how many bytes from the start of the array the attribute occurs. Since there are no other attributes, this is 0 as well. It is important to know that this function will store not only the stride and the offset, but also the VBO that is currently bound to GL_ARRAY_BUFFER. That means that you don't have to explicitly bind the correct VBO when the actual drawing functions are called. This also implies that you can use a different VBO for each attribute. Don't worry if you don't fully understand this yet, as we'll see how to alter this to add more attributes soon enough. Last, but not least, the vertex attribute array needs to be enabled. You can imagine that real graphics programs use many different shaders and vertex layouts to take care of a wide variety of needs and special effects. Changing the active shader program is easy enough with a call to glUseProgram, but it would be quite inconvenient if you had to set up all of the attributes again every time. Luckily, OpenGL solves that problem with Vertex Array Objects (VAO). VAOs store all of the links between the attributes and your VBOs with raw vertex data. As soon as you've bound a certain VAO, every time you call glVertexAttribPointer, that information will be stored in that VAO. This makes switching between different vertex data and vertex formats as easy as binding a different VAO! Just remember that a VAO doesn't store any vertex data by itself, it just references the VBOs you've created and how to retrieve the attribute values from them. Since only calls after binding a VAO stick to it, make sure that you've created and bound the VAO at the start of your program. Any vertex buffers and element buffers bound before it will be ignored. The first parameter specifies the kind of primitive (commonly point, line or triangle), the second parameter specifies how many vertices to skip at the beginning and the last parameter specifies the number of vertices (not primitives!) to process. If you don't see anything, make sure that the shaders have compiled correctly, that the program has linked correctly, that the attribute array has been enabled, that the VAO has been bound before specifying the attributes, that your vertex data is correct and that glGetError returns 0. If you can't find the problem, try comparing your code to this sample. Right now the white color of the triangle has been hard-coded into the shader code, but what if you wanted to change it after compiling the shader? As it turns out, vertex attributes are not the only way to pass data to shader programs. There is another way to pass data to the shaders called uniforms. These are essentially global variables, having the same value for all vertices and/or fragments. 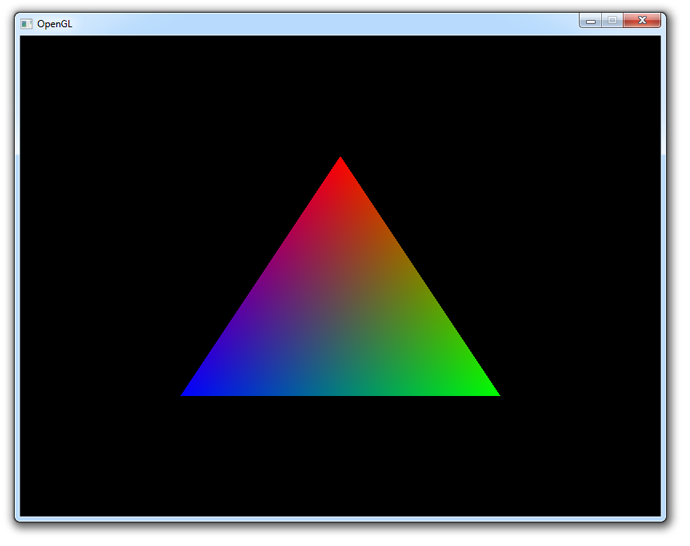 To demonstrate how to use these, let's make it possible to change the color of the triangle from the program itself. The last component of the output color is transparency, which is not very interesting right now. 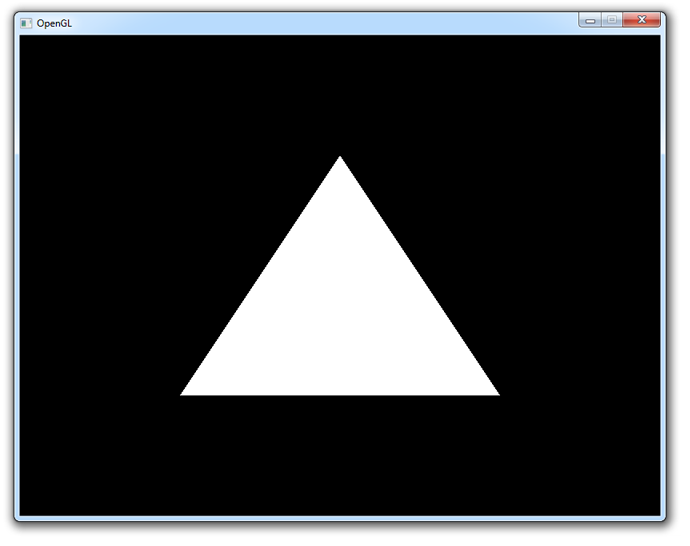 If you run your program now you'll see that the triangle is black, because the value of triangleColor hasn't been set yet. The values of uniforms are changed with any of the glUniformXY functions, where X is the number of components and Y is the type. 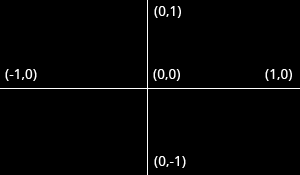 Common types are f (float), d (double) and i (integer). Although this example may not be very exciting, it does demonstrate that uniforms are essential for controlling the behaviour of shaders at runtime. Vertex attributes on the other hand are ideal for describing a single vertex. See the code if you have any trouble getting this to work. Although uniforms have their place, color is something we'd rather like to specify per corner of the triangle! Let's add a color attribute to the vertices to accomplish this. Make sure that the output of the vertex shader and the input of the fragment shader have the same name, or the shaders will not be linked properly. Now, we just need to alter the attribute pointer code a bit to accommodate for the new X, Y, R, G, B attribute order. The fifth parameter is set to 5*sizeof(float) now, because each vertex consists of 5 floating point attribute values. The offset of 2*sizeof(float) for the color attribute is there because each vertex starts with 2 floating point values for the position that it has to skip over. You should now have a reasonable understanding of vertex attributes and shaders. If you ran into problems, ask in the comments or have a look at the altered source code. Right now, the vertices are specified in the order in which they are drawn. If you wanted to add another triangle, you would have to add 3 additional vertices to the vertex array. There is a way to control the order, which also enables you to reuse existing vertices. This can save you a lot of memory when working with real 3D models later on, because each point is usually occupied by a corner of three triangles! The only thing that differs is the target, which is GL_ELEMENT_ARRAY_BUFFER this time. The first parameter is the same as with glDrawArrays, but the other ones all refer to the element buffer. The second parameter specifies the number of indices to draw, the third parameter specifies the type of the element data and the last parameter specifies the offset. The only real difference is that you're talking about indices instead of vertices now. To see how an element buffer can be beneficial, let's try drawing a rectangle using two triangles. We'll start by doing it without an element buffer. The element buffer still specifies 6 vertices to form 2 triangles like before, but now we're able to reuse vertices! This may not seem like much of a big deal at this point, but when your graphics application loads many models into the relatively small graphics memory, element buffers will be an important area of optimization. If you run into trouble, have a look at the full source code. This chapter has covered all of the core principles of drawing things with OpenGL and it's absolutely essential that you have a good understanding of them before continuing. Therefore I advise you to do the exercises below before diving into textures.